Sending you hugs and Strength, Style & Dignity! 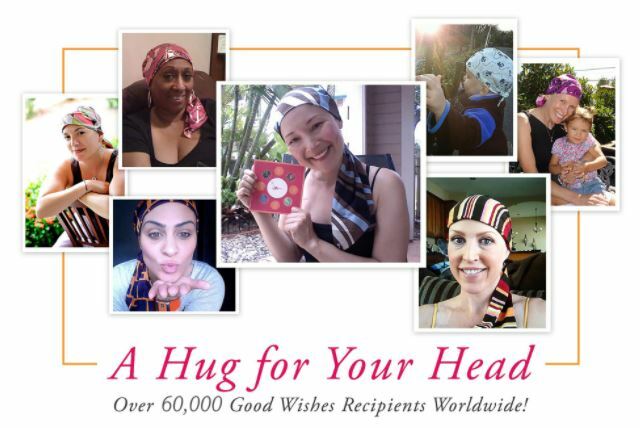 If you or a loved one is experiencing a loss or thinning of hair as a result of illness or treatment, “Good Wishes” will send you one free “It’s a Wrap©” or “Good Wishes square scarf” in the pattern and color of your choosing! These beautiful wraps and scarves are made from 100% cotton or cotton/poly breathable fabrics that flatter your face, protect you from sun and cold, and carry with them our good wishes wherever you go. To receive a complimentary wrap or scarf you need to choose one first choice, second choice, and third choice from the wrap options on their website and then fill in the online request form, download the printer-friendly request form or call us at (888) 778-5998. Delivery may take 4-6 weeks depending upon stock and demand. Free U.S. shipping is offered within the 50 states and Washington DC. Requests sent internationally or to U.S. territories, such as Puerto Rico, will need to pay shipping costs only.